thank u ma'am body slam! okay r we done mom?....hee hee, okay now, readeee.....andddd...wham! start the countdown ladees and gentlemen and gather your things because this match is over!! but mooooommmmm! i heard somebuddy was in town today and me n duk duk were just getting ready to wrap the copper and attach the electrodes for our..um...yeah okay okay u r right and they really are super delicious...thank you jasper and miss amy for the pumpkin blueberry treats. they are very very tasty and could not have come at a better time because if the electro magnet that we are making for no particular reason fails to work properly then maybe i can still attract a certain somebuddy by doing a super cool trick like this...for no particular reason...hey have u ever watched iron man? because mom never lets us but we know what he looks like from all the lunchboxes and notebooks that the kids at school have and well, besides being able to iron clothes what else can he do? like, maybe...row a pirate ship.....i hope?? do u know what is even better than coming home after having been gone a long time? why, coming home to a present of course! after i got home from school yesterday mom finally let me open the package that my friend romeo and miss christie sent me while i was gone and wouldntchoo know it was chock full of very special goodies. i cannot wait to introduce dukky to duk duk bcuz i think they will have a lot in common, and my other new toyfriends mini me and rojo bear are going to have such fun with chocobot and lil pink puppy. and of course i will have fun with them all! but there is one thing i am grateful that i will not have to share, and it is the delicious bounty of snackies that also came in my package. there were so many kinds, i hardly knew where to begin! and lucky for me there are so many of each it will be a long time before I have to decide where to end. so miss christie and romeo, if u happen to be reading my diary, me, my toyfriends, and especially my tummy thank u very much for such a wonderful and welcome gifty. even though i started off this week not so swell with a fizzy tummy, look at how lucky i got by the end of it! yep, that's right, my friend oskar sent me bear biscuits! and yeah u know i could tell that package that came in the mail was 4 me. me n duk duk cannot wait to try catching a bear with them, but just 2 be sure i had to taste test them to make sure they were going to work. and they were delicious!! thank u so much oskar and miss alicia! well diary, speaking of fizzy tummies i have 2 spend at least part of this weekend catching up on all the schoolwork i missed which is sort of a bummer because if we do catch a bear this weekend, well i guess duk duk will have to be very persuasive on his own about why the bear should stick around to join our circus act this year. i am so embarrassed. u see, my mom's friend brought her mom's dog sabrina over the other day so sabrina could get measured for a dapper doxie dud and uh, well, i kinda barked a lot at her cuz she barked at me, and well, next thing i know i'm staying home yesterday while mom and dad went to sabrina's house to deliver her dud and hang out. like, i totally missed out! 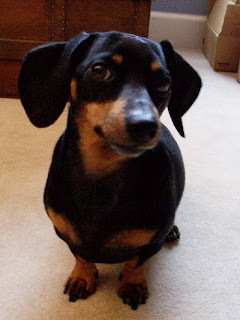 i am not even sure why i barked at her cuz she is part dachshund and she is sixteen years old, but all i can say is sabrina started barking first and i just couldn't help myself. and i'm not even a dominant doggie! i am hoping i can meet up with her again sometime and we can pretend this never happened. 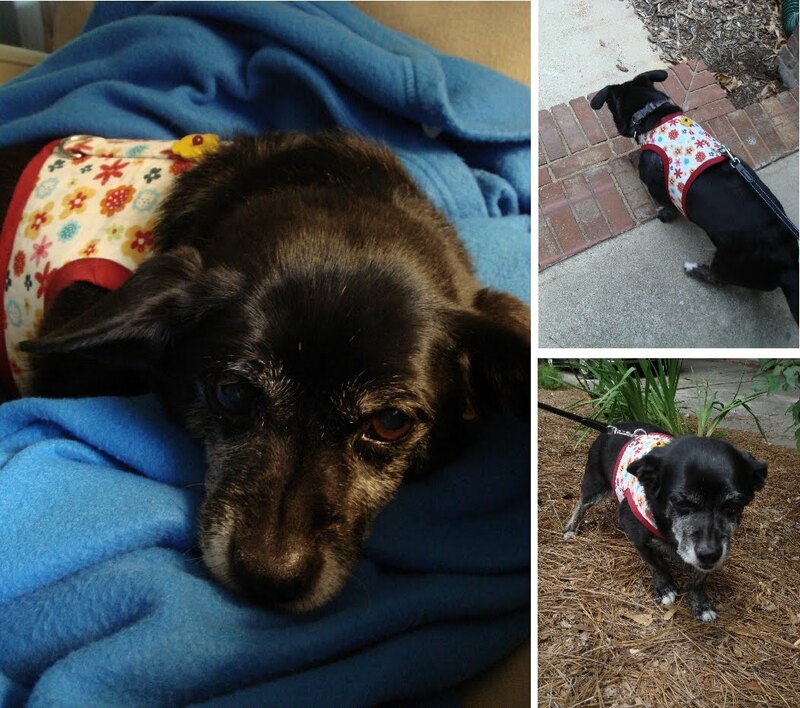 and maybe we can even go walkies together now that we both have duds! i really like how her dud turned out with the fabric that sabrina's mom provided, mom says it totally reminded her of something cindy brady would wear. mom even quilted it a little bit since Sabrina's mom is a quilter, and well, a quilter's dog's doggie duds ought to have quilting on it then, right? anyways, here are some pictures of sabrina from mom n dad's visit. isn't she really cute? next time, i totally wanna show her my tummy so's we can be friends and hang out. hee - and what a great time to do it, too, on account of my tan! hee - just a quickie post to link over to dodo & momo's blog, where our pretty little girls are modelling their dapper doxie duds. they are such wonderful models, i hope i'm not out of a job!! well, gotta run. duk duk and i are playin pirates of the caribbean. guess who i am! Well hello there, it's me, Baxter, your roving rover reporter reporting to you today from the crafts fair. It's early morning so luckily it's cool out and the foot traffic isn't too bad. Which is great for a little dog like me. What's not so great though? All the art and crafts are waay up high so there's not much for me to check out down here where I am. I'm a little perturbed about that, cuz all I got to report about is the pavement. Oooh - I spy some chalk. Hee, I'll show them. Yeah that's right. Baxter was here. And here, too! Um, yeah, so anyways, don't feel too bad for me because even though I can't enjoy looking at the stuff everybody made, I get to enjoy all sorts of little kids who come up to say hello. And you know what that means. That's right, sticky fingers that taste like ice cream and food! So letting little kids pet me and shake my hand isn't too bad a gig for my meal. Nothin like the hoops I usually gotta jump through anyways. Plus you know what? Even big people come up to say hi. 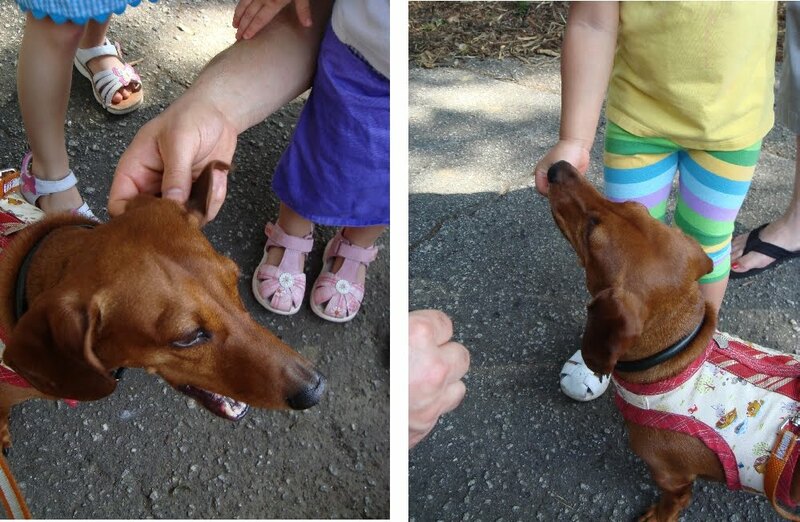 Mostly it's people who have doxies of their own, so I totally love meeting up with them. Speaking of which, hi lovely ladies from Georgia! Yeah, that's right, I'm talking to the three lovely pups I saw on your mom's phone. I can't believe your moms read my blog and that one of your moms actually ran into me here! So anyways, that's it here from the craft fair. A lot of fun even if there is no popcorn on the floor and no squir - whoa, what's that I spy over there? Pardon me, I must cut my report short so I can free this tree from squirrels. This is Baxter, your roving rover reporter wishing you the happiest of Sundays. Oh wait, what? Oh yeah, mom got a really cool cuff bracelet. Okay see ya! chasing squirrels, meeting new friends, and hanging with his mom and dad. A full day of doing for tiny chumley, whose nose took him everywhere he wanted to go. In search of backyard squirrels, in search of flea market popcorn, in search of park squirrels, and finally in search of backyard squirrels again. 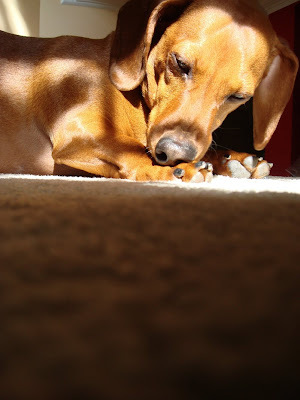 In fact, that's pretty much the way I'm sure Baxter remembers his day, with nose to the ground taking whiff after whiff like a little vacuum cleaner, save for the times when the good smells came to him (glad to smell ya, Kerri & Kerri's mom, and thanks for being blogfriends!! ), or when he actually found squirrels to chase (and today there were many). A shiny, happy day for the little kielbasa, who is now curled up beside me, sound asleep. wooty woot! wooty woot! just when i thought life couldn't get any better now that my pack is back together, mom let me sniff this. yep, a package, for little old me, from my new and lovely buddy annabelle! can u believe she sent me a blue dragon??? i thought those things were only in fairy tales but here he is, live and in person and according to annabelle's mom, indestructible. i am not sure what that means, but maybe mr.dragon can tell me while we're havin a little chew together, if ya know what i'm talkin about. and wait, that's not all! annabelle even sent me post-its that look like me, which i like totally needed cuz i ran out last week when me n duk duk used my post-its to make space suits for our play. 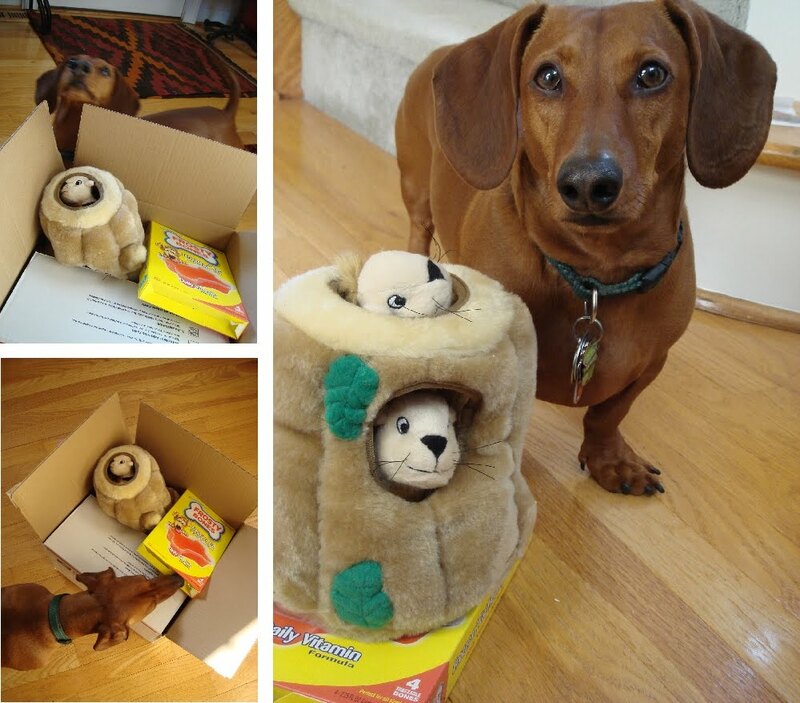 these doxie head ones are even cooler cuz if mom lets me, i can stick a few on for our school's next production when i have to be cerberus in our play, clash of the toyfriends. why they picked me for that role and not duk duk i'll never know, cuz he is a much better actor than me. anyways, the last picture on the bottom right is me posin with all my booty and i just want to say that i love it all! thanks, annabelle and annabelle's mom, for being so kind and generous! my mom says she's gonna work on your dud this week! so that's about - wait, what's that, diary? there's writing inside that card i chewed on? 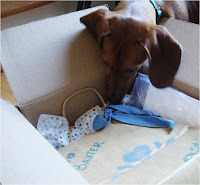 oooh - a letter from annabelle! um......could me n mr dragon have a little privacy please? Baxter is a little like a cat. He sleeps for hours in the sun like a cat. But he is still playful like a dog. He chases bunnies whenever he hunts outside. He is always tummy tanning when he gets the chance. Baxter loves to play with his toys. He also likes to sleep in the fresh warm laundry from the dryer. He will cuddle with you for hours straight. Baxter can do lots of cool tricks. He can be a man and shake hands. 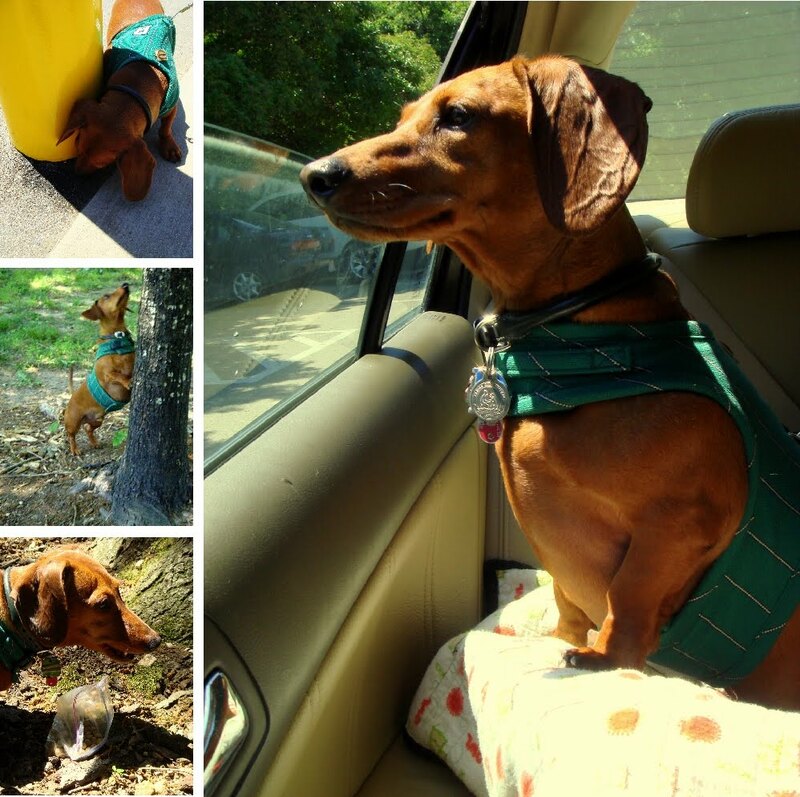 Baxter is the most lovable dachshund in the whole world. No dog is like him. ~Madeline, 13.9 years old, written on her visit to Baxter's house. well that is all 4 now cuz it is saturday morning and me and my little brother are gonna watch cartoons and snack on canine crunchies. 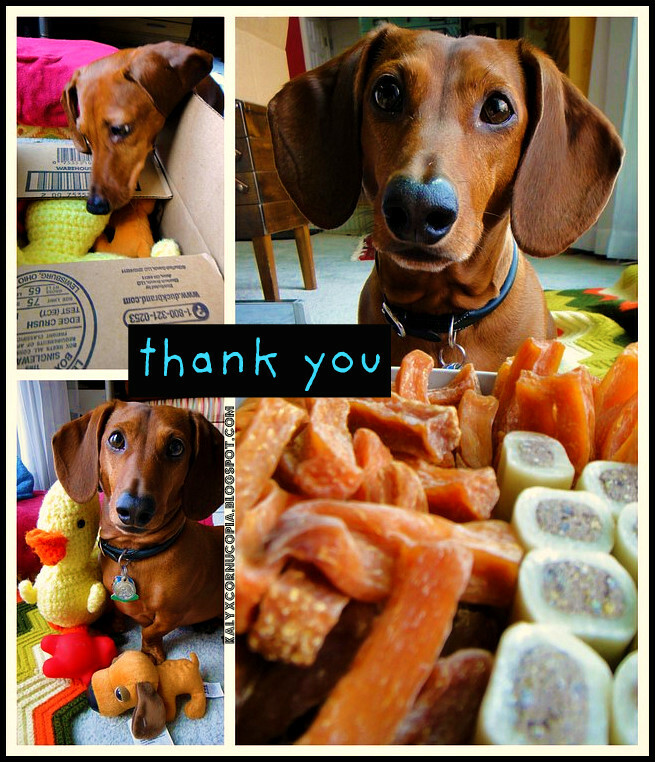 Much to his delight, it seems that lately all the packages that arrive to our house have been for the little kielbasa. So now, like bears to honey, tiny chumley will appear out of nowhere when I bring a package inside the house, gleefully circling the scene before him with nose held high in the air to take in the aromas that waft from the box as I open it. "Something for me, I hope? 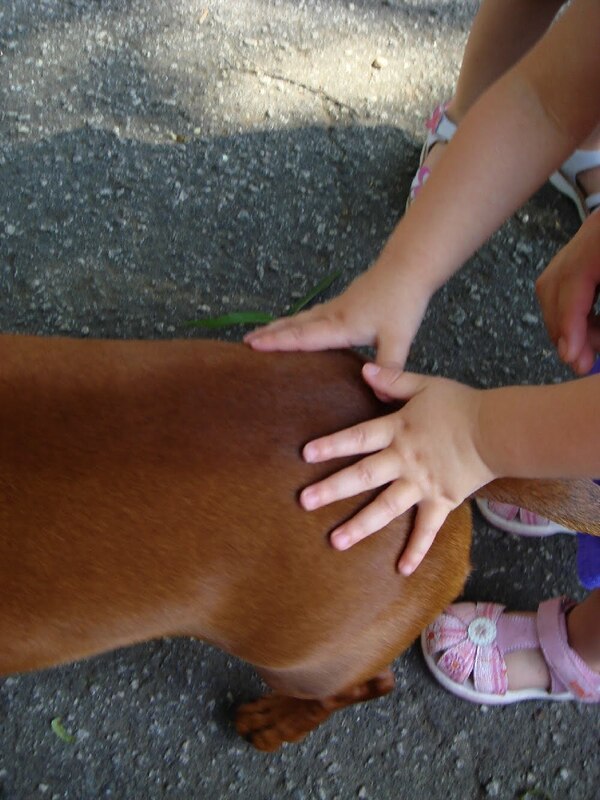 ", his questioning tail wags while pushing his way forward into the box for a better whiff. 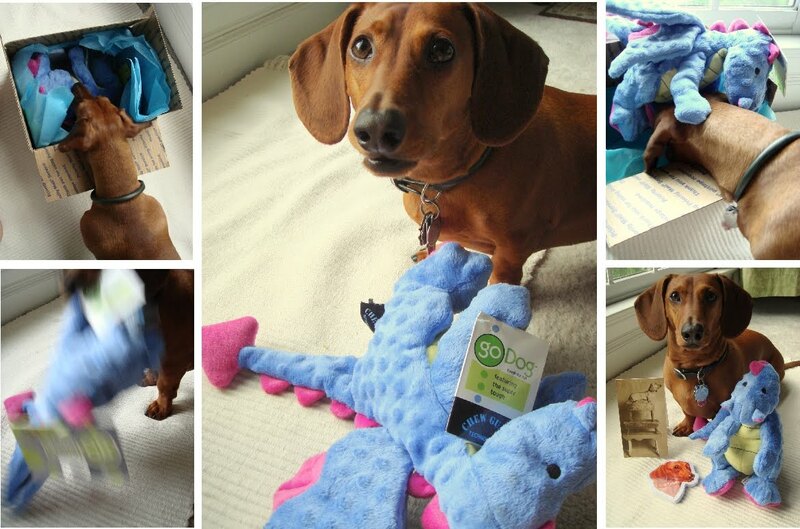 Boring stuff like flea medicine and heartworm chews barely register a response with tiny chumley, but toys and treats like the lovely ones we received from 3doxies yesterday bring out the woot owl in my little boy. "Wooty woot woot! Wooty woot woot! 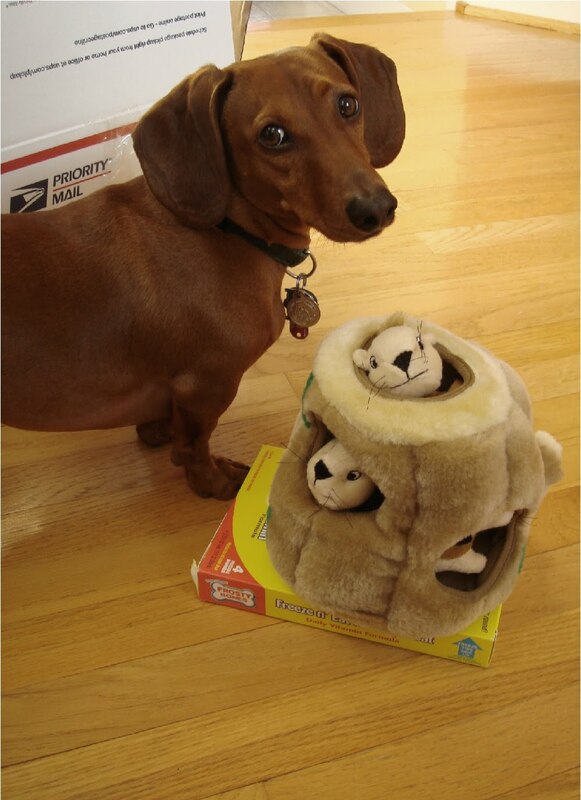 A squirrelly toy AND pupsicles!!" If Baxter had real wings he would have flown to cloud nine and back, but as it was my little woot owl managed to sit still long enough for a couple of tyra shots before the longing in his eyes became too obvious to ignore. Clearly, it was time to put the camera down and play. Today, a start on harnesses for the precious Annie, a shorthaired dapple that's sweet as pie and cute as a button. 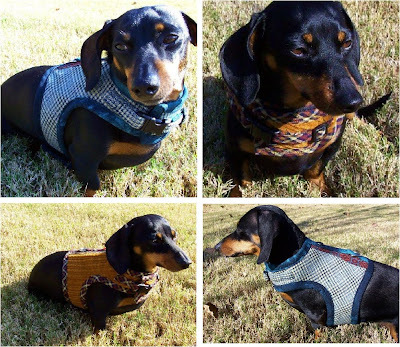 I sent Annie and her mom a fit prototype a couple weeks ago and now it's back, pinned and ready to serve as the pattern for Annie's very own dapper doxie duds. Little kielbasa may not appreciate how exciting this is for me, but he's happy just the same, thanks to the milkbones Annie's mom also included in the package. Pure tummy love. Thanks Annie and Annie's mom!! Ahhh, Christmas is only four days away and I am back home with no more shows to do this year. This past weekend was a blast despite the minimal foot traffic, but I knew going into this show that I would mostly be in it for the behind the scenes holiday action at Robin's house. And so with her kids and mom, we shopped, made presents, decorated cookies, and even engaged in late night giggles, the kind you get when bearing your strangest secrets on tape, like your most embarrassing moment passing gas. The kinds of things that the kids will remember forever. A fine time, really, that only would have been better had Tiny Tim and his dad been able to join me. 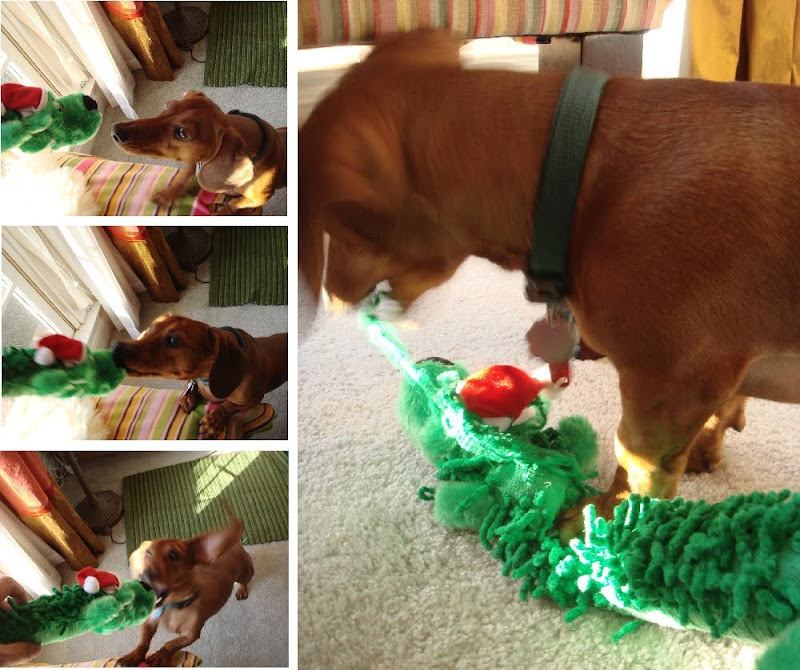 Special thanks to Kate & Allie & their mom for sending this very special green bobo for the little kielbasa! Somehow Baxter knew the minute I opened up the package that this was his, and proceeded whine and wiggle with the deep desire to tear into his new toyfriend. Ah yes, Christmas bliss is upon us. Yesterday I found a tiny boo boo on Baxter's nose. A medal of honor, it would seem, from Monday's rumble in the jungle. A special and random thanks, by the way, to Bludog for the extra goodies in the package I finally opened that contained Miss Molly's marked up prototype harness. 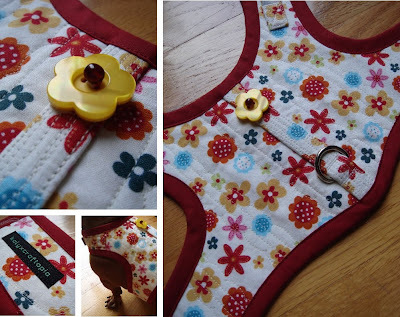 A girl can never have enough fabric or trim, so many thanks for sharing!! 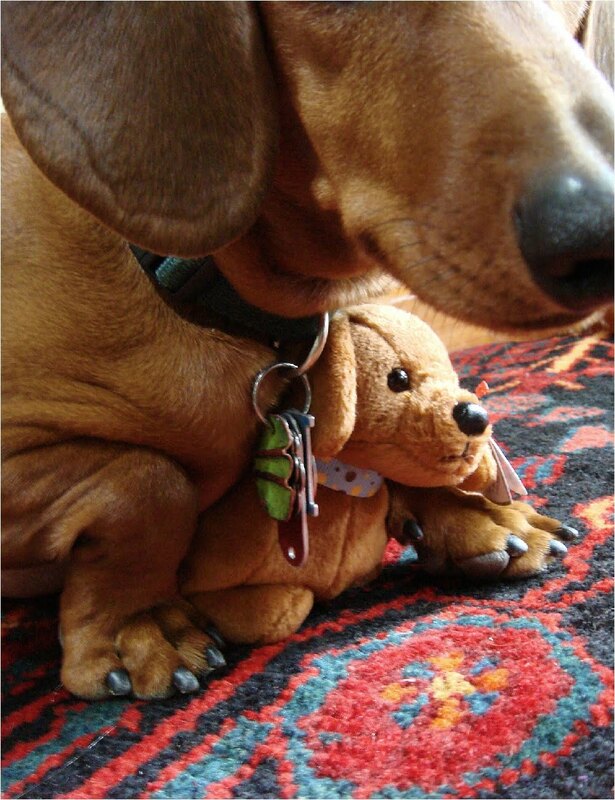 Before I leave, I just wanted to send out some hugs and wishes for a speedy recovery to Baxter's dapper doxie buddy Oskar. Oskar is the suave black and tan mini, whose mom chose a couple of fabric selections a month ago for his winter wear harnesses. Oskar was quite the trooper, modelling his duds despite getting a case of the urpies. Hopefully he's all better now. It's mighty hard to be your dapper self when you're tummy's feelin green, isn't it, Oskar? so i have no idea what the fuss is all about but lately mom n dad have been treatin me like royalty. i don't mind, except for the fact that they won't let me horse around as much as usual. that is really the pits cuz guess what - a package came yesterday and inside was a present from oskar - for ME! 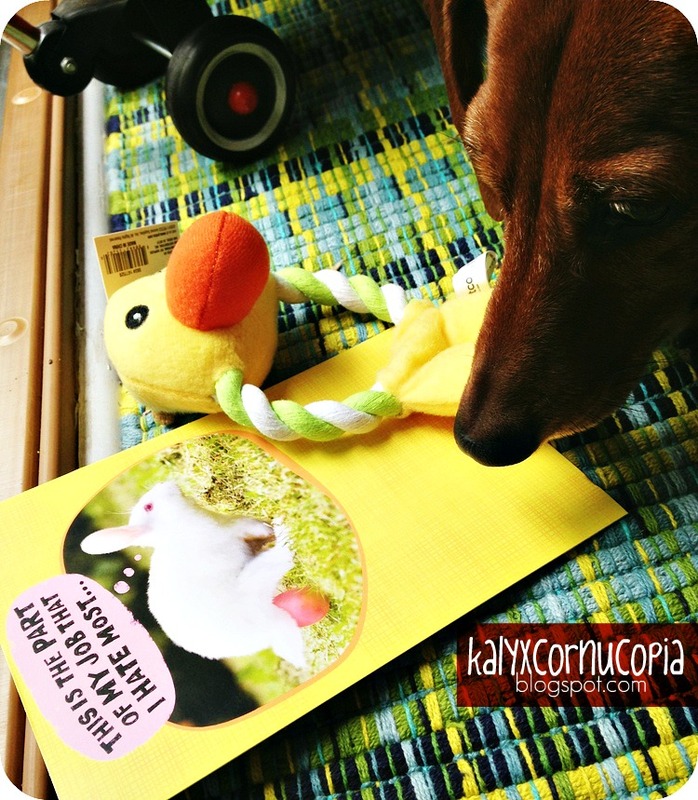 it was a bunny toyfriend!! how could i be any luckier? 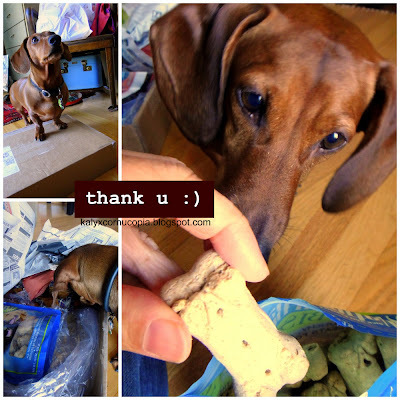 my day was definitely lookin up after having spent some of it in a box while mom ran some errands. i sure hope i can meet oskar one day so we can play together. he seems like such a good boy. anyways, here is me, playin with my new friend bunnito bunnalini just moments before mom told me i had to sign an interim peace treaty with him on account of my neck thingy and how i should take it easy for a while. crikey! i'm a wolf, not an ambassador. but mom as right cuz i don't wanna be hurtin like that again. so with great reluctance, i stopped trying to kill him. and cuz neither of us know how to sign our names and what with the piggy flu n all, we just kinda bumped paws. it's really not fair, diary. who ever heard of a truce with a bunny??? sigh. but i guess i can live with being nice to bunnito for a couple of weeks. i am glad i still have my dewclaws cuz i am counting down the days and need all my toes and my tail and both my ears just to do it. just 13 more days til you're toast, bunnito bunnalini. pssst - i've been thinking about it and don't tell anybody but i've been havin fun with bunnito and i don't even have to de-stuff him to do it. maybe this truce ain't so bad after all. 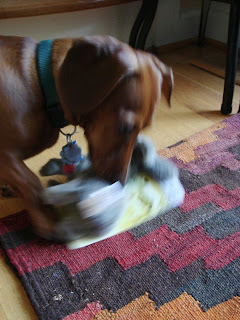 thanks again oskar and oskar's mom for my new toyfriend! yippee!! Today's post is for Oskar, a super chipper mini black and tan fella whose mom has requested custom winter and summer harnesses. 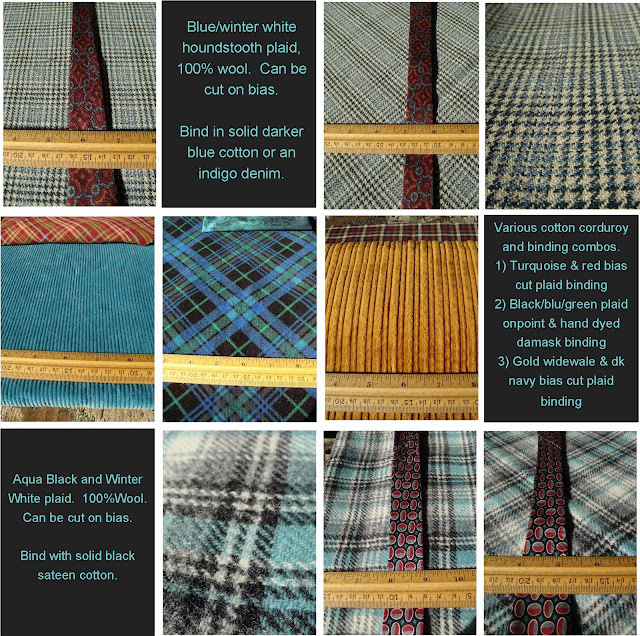 I've sent his mom a prototype based on his measurements and pulled some fabrics here that might be winter wonderful for a black and tan. Would a chocolate and light turquoise babywale corduroy houndstooth with brown binding and red necktie silk accent be cool? Or would a cozy plaid woolen cut on the bias and bound in a solid be Oskar's thing? A golden widewale with bias cut dark plaid binding that might could pass him off as a Steelers fan? Maybe one of the others? We'll see what wags Oskar's tail for his winter fabric selection. I want to thank Oskar's mom for picking me to make something magical for her vivacious vienna sausage, because I know choosing me to make a harness is not a choice everybody should make. I'm not in this to build an empire, I'm not here to undercut the competition or even complete with them. Choosing me is like walking blind down a dark hallway, but knowing that at the end, that there will be light. I understand why folks might choose a ready made option. All that's pictured here are fabrics. The leap of faith is not for everyone. But for those who take it, the reward will be waiting. In future posts: oskar's summer fabric options, and finished product.